Make new friends, strengthen your faith, and worship our great God! Within these pages, you will find information on our camping programs and facilities. Programs include youth camps, summer and winter retreats, and family camps. Our facilities are also available for holding your own camps and retreats. 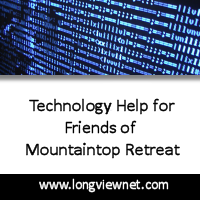 Mountaintop Retreat has been providing a venue for life-changing experiences for more than sixty years. Whether it’s participating in a Bible drill, learning of the love of Jesus from a dynamic speaker, shooting down the water slide, zipping down the zipline or spending personal quiet time in the mountains of Colorado, you’ll find that spending time away at Mountaintop Retreat provides the opportunity to commune with the Lord, in the beauty of His creation, and be refreshed. Prepare for the ultimate camp experience! From Colorado to around the world! Enjoy sports, games and outdoor adventures! Thousands of memories are made every camp season! We can customize, for your group, your own special camp experience. Perhaps a retreat, or a business meeting, or a family reunion! Bring us your ideas for your own unique camp experience and we’ll provide a scenic location, a venue and other resources that you design!